Students creating digital stories at the DigLibArts Collaboratory. Digital Storytelling is simply, a way to tell stories using digital tools. Most digital stories are created as movies but the definition now includes narratives created with presentation tools and born-digital publishing. At DigLibArts we use Digital Storytelling as a collaborative and creative assignment that enables students to connect to large themes while developing a personal narrative. Digital Storytelling provides a platform where students can build on active learning strategies in writing, storyboarding, multimedia creation and assessment-sharing in open learning environments. Students also develop digital literacy skills through project-based learning. Accompanying close reading assignments aids student understanding and sparks discussion. This process engages students in a way that helps them recall and reflect on the many themes and ideas discussed throughout their course studies. This encourages students to be independent learners who can assess their work and grow from the experience. Additionally, in the process of using digital technologies, students are empowered to contribute to a learning experience that allows them to think about their actions within their community as well as on a global scale. During the Fall 2015 semester, social work students participated in a partnership with the Fifth Dimension learning program at the Boys & Girls Club of Whittier and DigLibArts to help parents from Lydia Jackson elementary school create digital storybooks as part of a family literacy (and digital literacy) project. View our photostream of this partnership. Copyright & Fair Use – Stanford University Libraries’ take on fair use and what it really means. Instead of relying on fair use, you can also search for images or videos that have Creative Commons licenses. The creators of these materials have decided to allow others to share, remix, or otherwise use their content, under certain conditions that are described in their CC license. Always check the license to understand what those conditions are. Some materials are in the public domain, which means they are owned by the public, so their use is unrestricted by intellectual property laws. You can always use public domain resources without obtaining permission from the original creator. Works published in the United States before 1923 are in the public domain, as are most U.S. governmental publications. For other published and unpublished works, public domain status can be a little more complicated. The Digital Comic Museum contains some beautiful and unique Golden Age comics, the copyright status of which has all been researched and confirmed to be public domain. They’re free, but you do have to set up an account in order to download. World Images – from the University of California, this collection of images is CC-licensed. YouTube – after running a search, you can click “Filter” and then “Creative Commons” to limit to CC-licensed videos. Internet Archive – a nonprofit site that preserves images, documents, and film. Most of the videos on the site are either public domain or Creative Commons-licensed (check the license to be sure!). SoundCloud – searchable by genre, duration, tempo – and you can limit to CC-licensed works. MusicShake – make your own music. WeVideo; email Sonia Chaidez or Student Technology Liaisons to be added to college license. No matter what the copyright status of the materials you use in your digital storytelling, always be sure to credit your source. The Purdue Online Writing Lab is an excellent resource for help citing electronic resources in APA format. harshilshah100 (2009) Vienna – Rathaus, [digital image]. Retrieved October 9, 2009 from Flickr:http://www.flickr.com/photos/harshilshah/3823135957. Takayma-Ogawa, J., & Willette, J (Creators). OtisCollege (Poster) (2007, March 14). What is information literacy [Video] Retrieved fromhttp://www.youtube.com/watch?v=yeopJX5jJV8. darkinsidious (Poster). Slingshot fun [Video]. (2007, January 29). Retrieved from http://www.youtube.com/watch?v=CCmZYce0J2E. *Thanks to librarian Kristen Yarmey at the University of Scranton Library for helping to organize this attribution list. 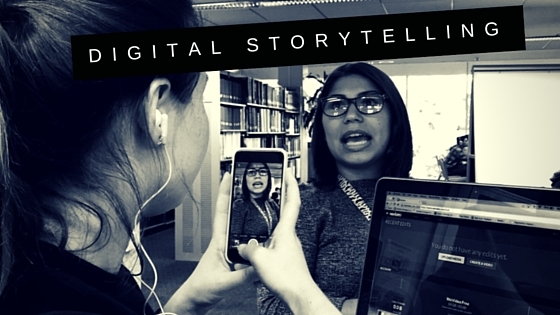 Digital Storytelling is simply, a way to tell stories using digital tools. Most digital stories are created as movies but the definition now includes narratives created with presentation tools and born-digital publishing. As part of DigLibArts, we use Digital Storytelling as a collaborative and creative assignment that enables students to connect to large themes while developing a personal narrative. Digital Storytelling provides a platform where students can build on active learning strategies in writing, storyboarding, and assessment-sharing in open learning environments. Students also develop digital literacy skills through project-based learning. Accompanying close reading assignments aids student understanding and sparks discussion. This process engages students in a way that helps them recall and reflect on the many themes and ideas discussed throughout their course studies. This encourages students to be independent learners who can assess their work and grow from the experience. Additionally, in the process of using multimedia technologies, students are empowered to contribute to a learning experience that allows them to think about their actions within their community as well as on a global scale.